Ralston’s Swing Arm System offers flexibility in moving operator controls into a convenient ergonomic position for any operator. The system allows operator to quickly and easily move operator controls out of the way then back into position. 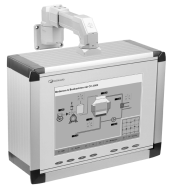 Though the flexible arm system can be used with most enclosures, it was originally designed to work in combination with the OICP Series Operator Interface Control Panel. Made from anodized aluminum, the OICP control panel comes complete with framed body, screwed rear plate, front plate hardware kit, and mounting accessories. Flexible Swing Arms are made from extruded aluminum tubing and cast aluminum couplings. Control Panel: Anodized aluminum with corners finished in RAL 7016 charcoal grey polyester powder coating. Swing Arm Couplings: Aluminum finished with RAL 7035 light grey polyester powder coating. The Swing Arm system is built to the requirements of NEMA/EEMAC Type 12 and are IP65 rated.